Van-tech offer a painting and fitting service for most of our products at our fitting centre in Halesown, West Midlands call us on 0121 550 4628 for a quote. You might see cheaper O.E Sportline style side bars, but when you buy and fit these you’ll appreciate the solid quality knowing that you won’t have any problems . We think these are a true comparison to any side bars on the market and represent fantastic value. 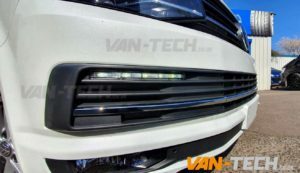 This VW T6 Transporter Daytime Running Light LED kit will fit VW Volkswagen Transporter T6 Vans 2015- onwards, this kit comes in a primer finish and is repainted to match the van it is being fitted to. Enhance the style and appearance of your T6 with this new accessory add-on. These bright LED lights not only act to visually enhance the look of the T6 exterior but also help in promoting greater road safety, particularly in poor driving conditions such as fog and rain. 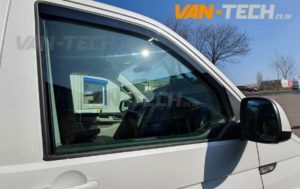 Improve the ventilation and airflow into your VW T6 Transporter whilst reducing the noise when driving with the windows down increasing your comfort. These high quality dark wind and rain deflectors increase safety when driving by creating a pleasant environment in the car during any weather. 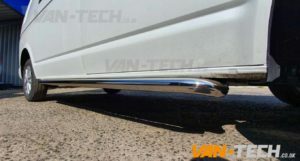 VW Transporter T6 Chrome Front Lower Grille Bumper Trim, this chrome trime is ideal for adding a bit of style to your T6 Transporter Front grille.